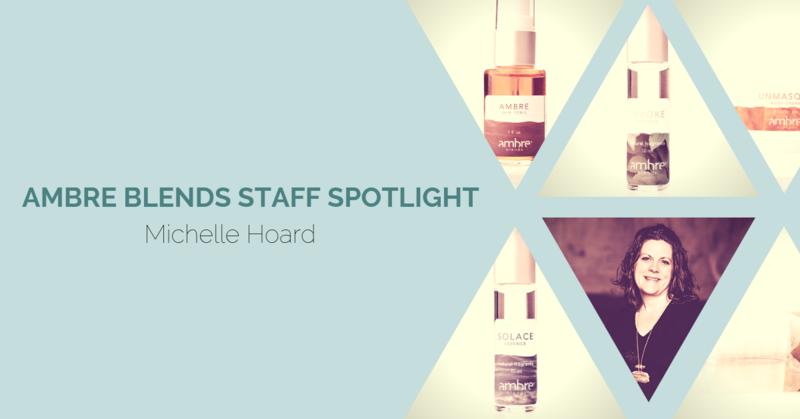 When we launched Ambre Blends Natural Deodorant in December of 2013, we couldn’t have done it without Michelle. Starting in 2012, we collaborated with Michelle to test out a natural deodorant option for our product line. After many, many, many batches, we perfected the high-quality formula that stood up to the test of different seasons, situations and environments. We want you to get to know the co-creator and producer of Ambre Blends Natural Deodorant, Michelle Hoard! What is a day in the life of Michelle like? The deodorant=making process is much like making a cake…mixing, weighing precise measurements, pouring and labeling. The natural deodorant is completely made by hand. What is your favorite part about working for Ambre Blends? We are all like-minded in wanting to execute a quality product made by hand with no harmful ingredients. There is so much love behind the products. What are some your favorite organic products you use? Besides Ambre Blends Natural Deodorant, I use Dr. Bronner’s Castile Soap, coconut oil and Young Living essential oils. What is your favorite Ambre Blends product/essence? While the natural deodorant is obviously high on my list, the Skin Tonic is a close second! I use it daily before bed and after putting on my makeup. It gives me the scent that I love and moisture that our skin craves so much. I really love all the scents but prefer the Unmasque and Solace in the natural deodorant. What is a fun fact about you that people don’t know? I am a Registered Nurse that specializes in pediatrics. What do you enjoy doing outside of work? Watching my daughter Liza and my son Jack play sports, boating with my husband and kids and listening to local music with friends. Why should people be using Ambre Blends? Ambre Blends products are made without chemicals or harmful ingredients. You can be assured when using the products that they are not harming you or your family. What has been one of the most rewarding experiences working at Ambre Blends? I love that Ambre Blends is a woman-owned company that is an amazing example of sending empowerment to young girls that they can do anything they set their mind to.